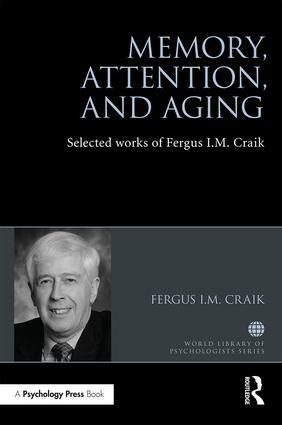 Memory, Attention, and Aging is a collection of some of the most influential journal articles previously published by Fergus Craik and his collaborators, with new introductory material unifying the research of this noted cognitive psychologist. The reprinted articles are grouped into six sections reflecting Craik’s various research interests across his career. The first section on short-term memory focuses on research concerns Craik uncovered in the 1970s, but are still valid today. They comprise theoretical suggestions and data on the nature of STM, including the notion that working memory may be defined as attention paid to features of items held in conscious awareness. The second section on levels of processing contains the very influential articles by Craik & Lockhart and by Craik & Tulving on memory research, in addition to a later article in which Craik gives a critical account of the LOP work. Craik’s third interest is in cognitive aging. The section contains two articles from the 1980s in which Craik lays out his ideas on age-related changes in memory, plus a more recent article addressing lifespan changes in cognition. The fourth section on attention and memory has two articles that report on the effects of divided attention on subsequent memory, and differences between implicit and explicit memory processes. The fifth section on cognitive neuroscience includes an early PET study probing neural correlates of LOP, and a study searching for the neural correlates of the "self" concept. Finally, the sixth section contains an article on bilingualism that explores age-related differences in executive functions as a consequence of bilingualism, and a study showing that bilingualism postpones the onset of Alzheimer’s disease. Grouping the most highly cited and groundbreaking articles of Fergus Craik in one volume, this book will be of interest to a wide spectrum of students and professional researchers. Part 1: Short-term or "Primary Memory"
Fergus I. M. Craik is a cognitive psychologist whose research interests include human memory and cognitive aging. He is a Senior Scientist at the Rotman Research Institute in Toronto, and a University Professor Emeritus at the University of Toronto.